Reserve your listing in the Bend Health Guide today. The sooner we receive your ad, the better your placement and the more time you are seen in the online directory. Bend Health Guide is published twice a year, available in Bend for a full six months of viewing. All Display Ads come with a complimentary Simple Listing in both our Printed Health Directory & our Online Health Directory! 2) Pick your size ad, you can request a meeting or phone call to help you decide. 3) We will invoice you for your Ad, once your invoice is paid, we will begin your design process. 4) Design your Ad with one of our fabulous Ad Designers, AD Design is FREE!!! 5) Fill out the Simple Listing Form on this Page for your Business Listing in both Print & Online Health Directory. 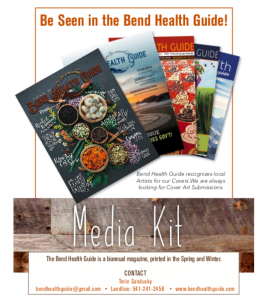 7) See your beautiful Ad in print in Bend Health Guide & get new clients!